A Place for Kia: Scrap'n Stamp Movember Blog Hop and giveaway! We are hopping over at Scrap'n Stamp today and I hope you will join us for this month's challenge which you can find on our Facebook Challenge Page. For those who leave a comment on each design team members blog, we will be giving away three (3) sets of the Retro Masculine Die set. 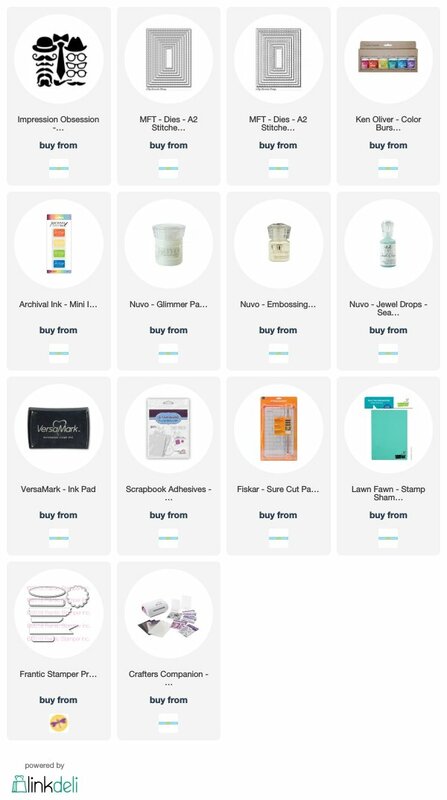 For those who join us for the challenge we have a $50.00 gift card, so be sure to join in the fun. 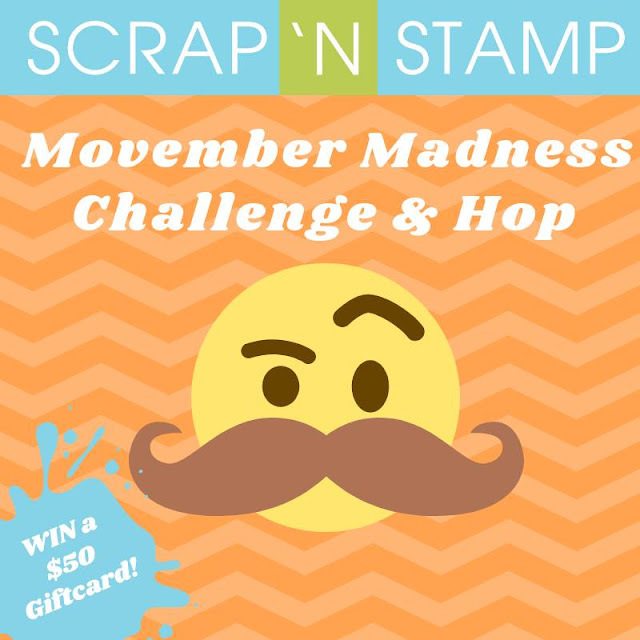 Scrap'n Stamp will also be donating 10% of net sales on hop Day to the Movember foundation. On to the card I made for today's hop, and I hope inspiration for you to join in the challenge. 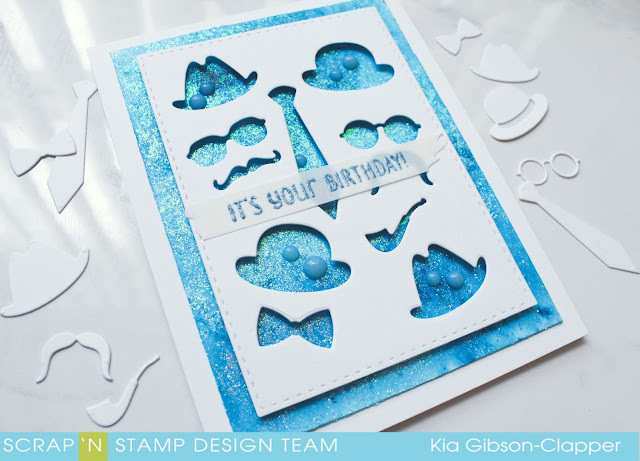 I used the Impression Obsession Retro Masculine Die Set to make a negative panel for my card front, and I went with some sparkle, even though this is for a guy. The guys tell me they love it when I do all the fancy stuff ... so fancy stuff they will get. I first die my background using Color Burst in Ultramarine Blue. I did two layers, the first giving the colour all over, then I added a second layer of the powder making darker blues in certain areas. Once dry, with my finger, I spread Nuvo Glimmer Paste. As I was doing it with my finger I was able to ensure I put down a thin layer. I then set it aside to dry. I die cut a panel with my stitched rectangle die smaller than my glimmer panel. I then arranged the dies on my panel and die cut, which left me the negative. I attached the panel to my glimmer base with foam dots, using a total of 28 foam dots to ensure I did not have any sag. 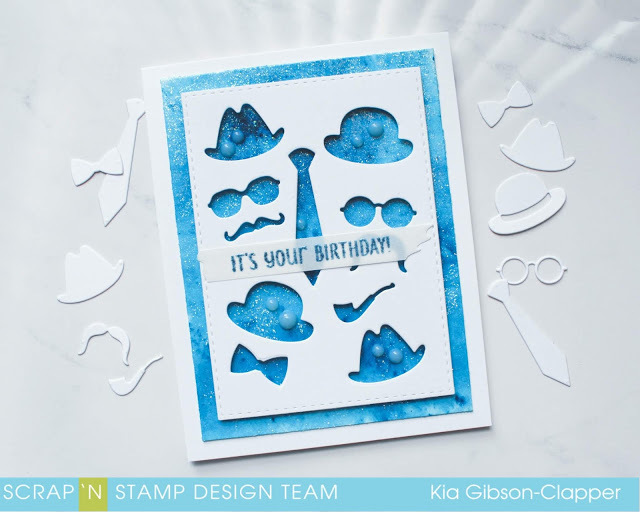 I then stamped my birthday sentiment on vellum using Ranger Manganese Blue ink, then added Versamark and heat embossed with Nuvo Embossing Powder, then die cut and attached with Vellum glue. To finish I added Nuvo Jewel Drops in Sea Breeze. I hope you have enjoyed my card today. Next up is Jessica. Nice to see a masculine card with lighter colours. And I like the way you used the dies. BEAUTIFUL card! I think that a lot of men like a little pizzaz on their cards! maybe some won't admit to it! LOL!! But I think what you did is absolutely perfect! This is a great card! I love how you die cut the images and backed with colorful paper. Love the effect of using the negative - great card!